Are you already letting your hair down; unbuttoned your collars, feet up and ready for the weekend? I sure am. After the long Raya break (I know some of you luckier ones may still be enjoying the extended break since last weekend! ), the coming two days seem relatively short. But as we are nearing to the last lap of 2013; you know that public holidays will come in succession and before you know it … we will bid the year goodbye. How has 2013 been treating you thus far? Have you eaten enough, traveled to your heart’s content, or slaving yourself to your work desk and dreaming that you’re somewhere else instead? 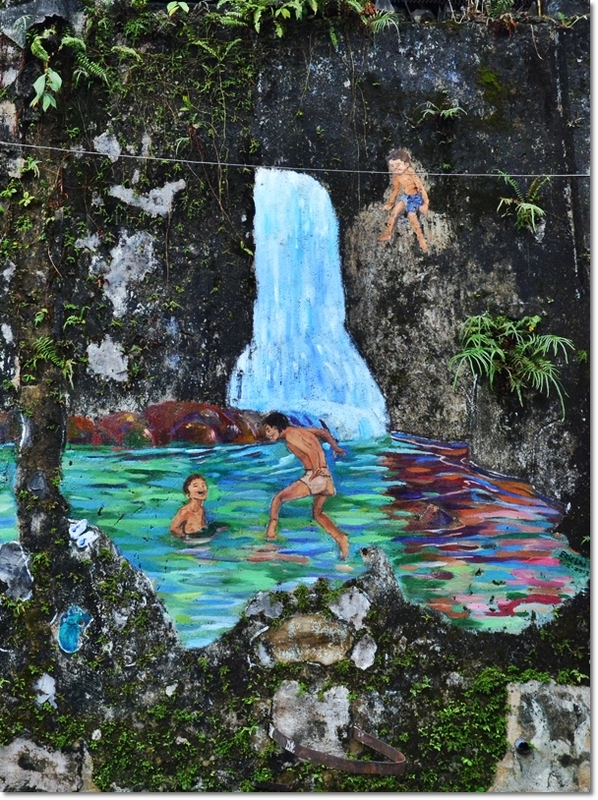 Arts and cultural elements, as well as traditional games played when we were kids are highlighted by art teacher Eric Lai and his team of students; splashing colours back to the otherwise dead alley in town. 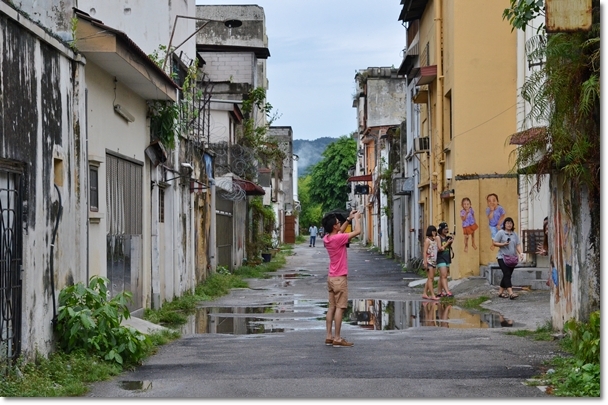 Remember in my Staycation in Penang post? 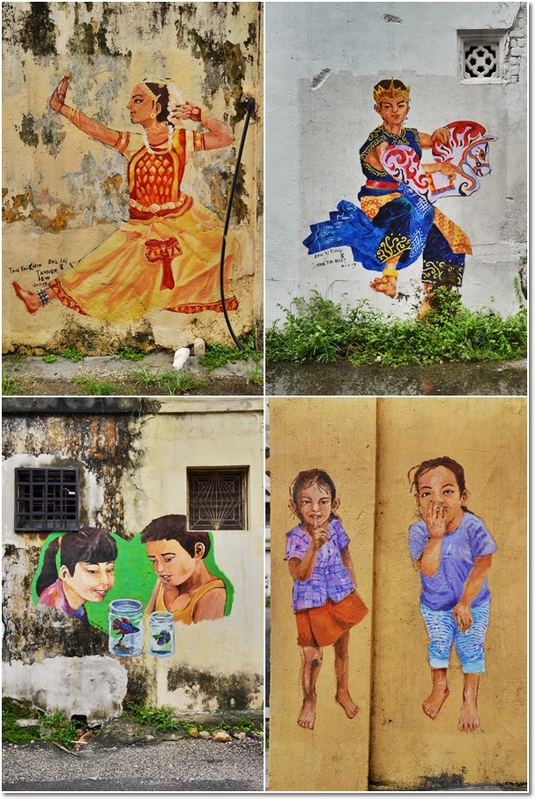 Where one of the 10 Things to Do in Penang was to seek, observe and take snapshots of the murals and steel caricatures around Penang? Now, you don’t have to travel that far if you’re in Ipoh and suddenly that creative side of yours feel like whipping out that cobwebs-infested camera from the darkest corner of your house. 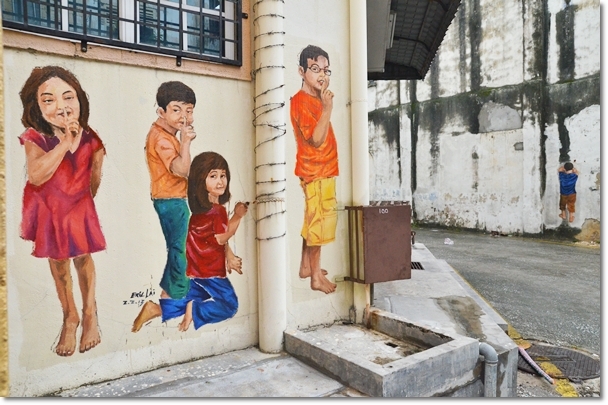 Between Jalan Masjid (Hume Street) and Jalan Sultan Iskandar Shah (Hugh Low Street) in Ipoh town, is this back alley filled with colourful wall murals depicting life from the simpler days when pleasure was attained from blowing bubbles and hiding around corners. Don’t be alarmed to see a huge crowd gathering around this back lane in the heat of the afternoon. Lion Dance (Tarian Singa); a common festive highlight back in the olden days during Chinese New Year celebration is slowly phasing out in these modern times. 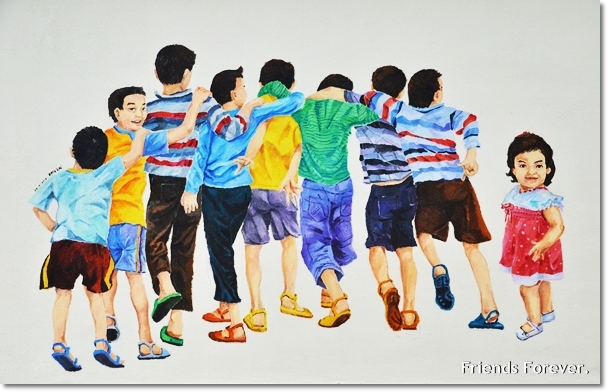 Hide & Seek brought so much priceless fun to our childhood days; when all we needed were a good number of players and well, spaces to hide from the seeker. The adrenaline rush came when the seeker had to count to ten while the rest had to quickly scrambled for places to hide; sometimes sharing the same seemingly ‘invisible’ spot … gleefully giggling in silence. 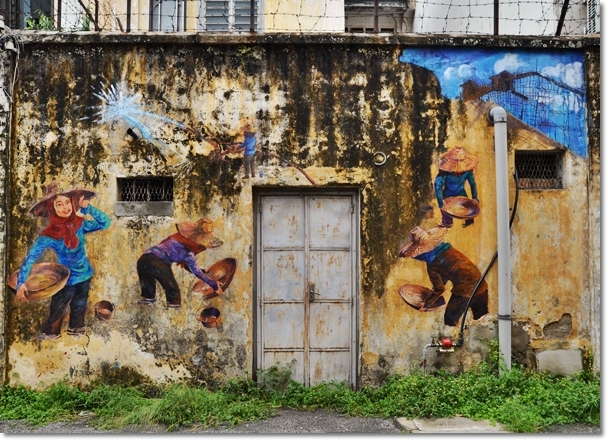 Ipoh is a town built on the glory days of tin mining in Malaysia. The story and legacy was depicted well in the A Tin Mining Family exhibition @ Falim House; that lasted for a good 3 months. The Eagle & The Chicks? If you haven’t seen or play this game before, then you must be a baby of the 90’s. Or Millennium generation. 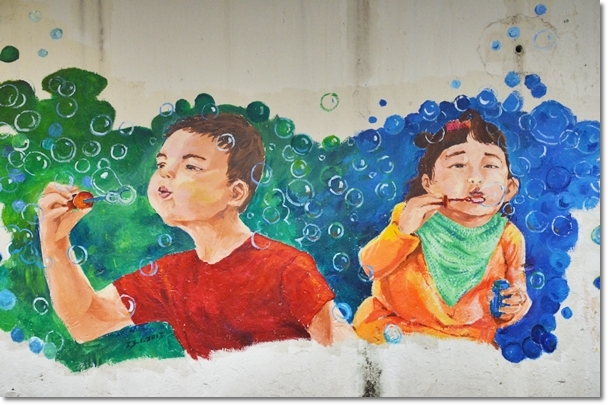 We did not blow water (you know what I mean if you understand Cantonese) back when we were kids, we blew bubbles. And Mum banned us from bubble gums. Arts and Potteries. 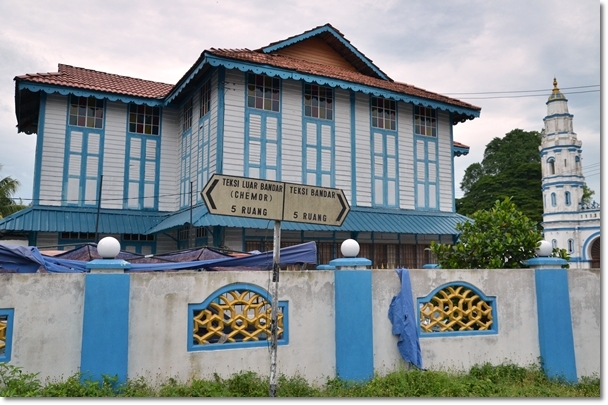 If you haven’t been to the town of Kuala Kangsar, you should. In the Discover Perak episode where I was featured in, we actually learned to make ‘labu sayong’ from the traditional craftsmen in the villages of the royal town of Perak. 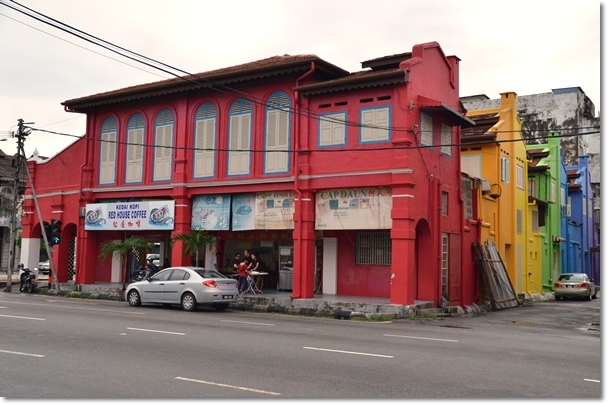 Hume Street or Jalan Masjid leads to the one of Ipoh’s most iconic landmark; the Masjid Panglima Kinta. The other end of the road? We name that portion Coffin Street; thanks to the row of funeral parlours there. 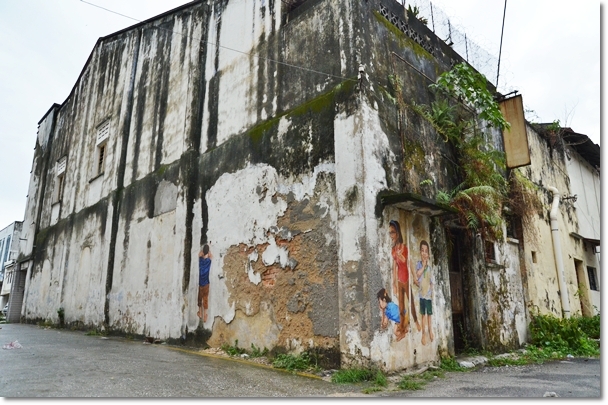 The Ipoh Street Arts back alley is directly opposite of the rainbow-coloured shops along Hugh Low Street. You must have memories of the now-renamed to Red House Coffee Shop’s durian stall when in season. 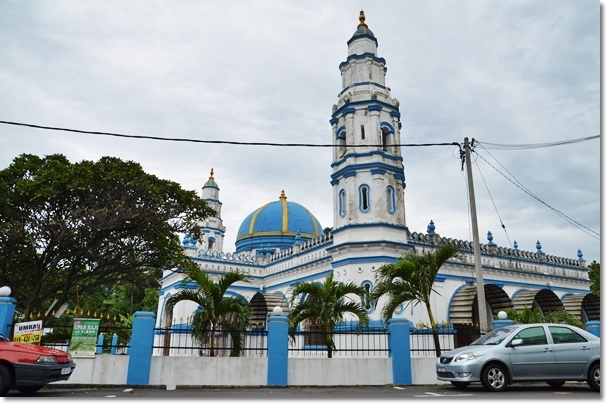 Masjid Dato Panglima Kinta near to the Kinta River, at the end of Hume Street. 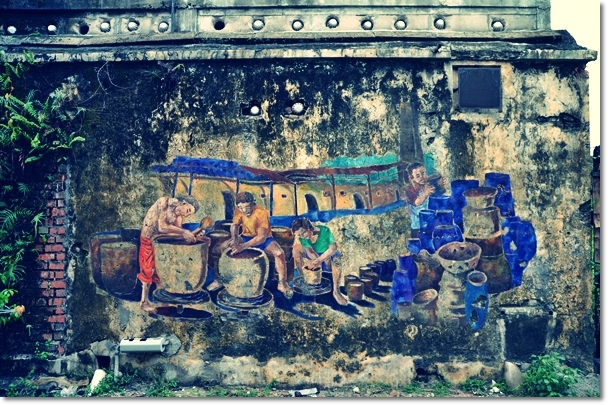 Hoong Tho; one of the oldest restaurant in Ipoh old town that is still going strong. 56 years of history; since 1957. Yes, we are celebrating out 56th years of Independence this month. Hoong Tho’s Cempedak Red Bean Mooncake : The Mooncake Festival (Mid Autumn Festival) is almost here. Have you tasted your first piece of mooncake yet? 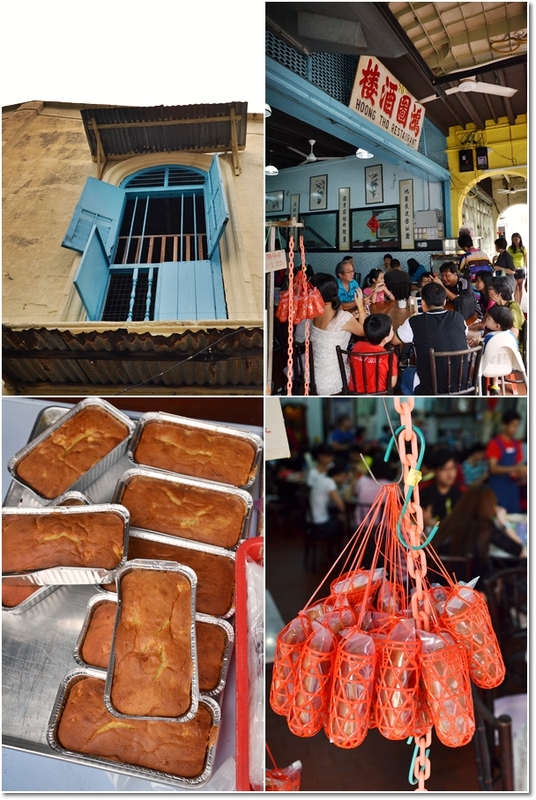 *Hoong Tho restaurant bakes a mean cempedak butter cake, and various traditional pastries all year round. Come Mid Autumn festival, they will sell the Cempedak (jackfruit) Red Bean mooncake studded with melon seeds, encased in a buttery, crumbling pastry. More information about Hoong Tho can be found in THIS POST. 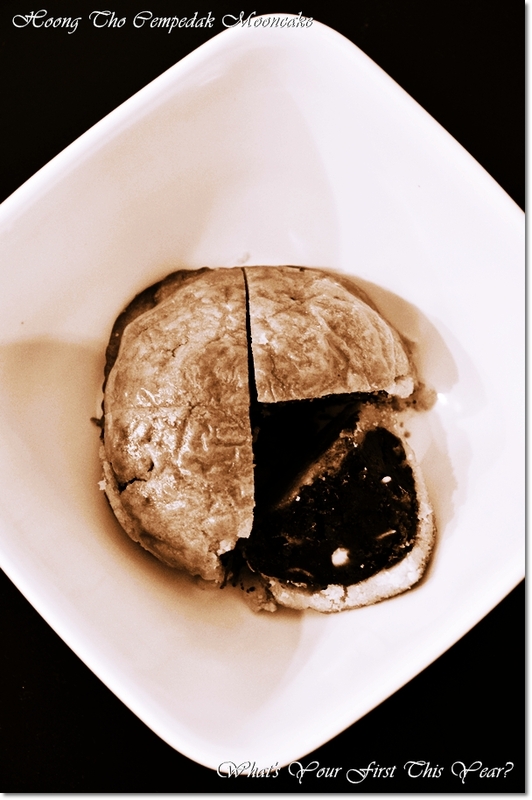 *Story about traditional mooncakes (unconventional ones) and the cempedak cake can be read HERE. Ipoh Street Arts @ back alley between Jalan Masjid and Jalan Sultan Iskandar, Ipoh. Directions : As you come along Jalan Dato Onn Jaafar (Cockman Street) towards Super Kinta/UTC’s direction, you will reach a crossroad with traffic lights. 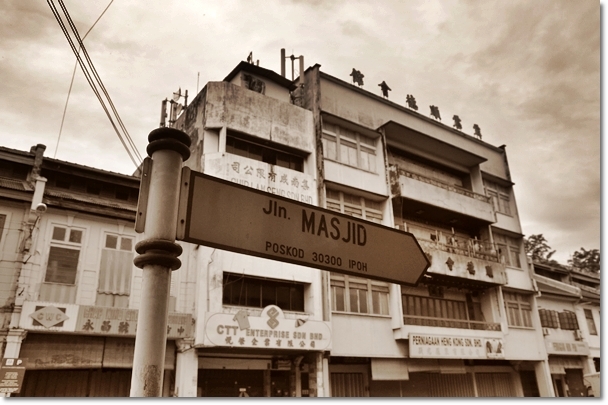 This is the junction that will lead you to Ipoh Old Town if you turn LEFT into Jalan Sultan Iskandar (Hugh Low Street). 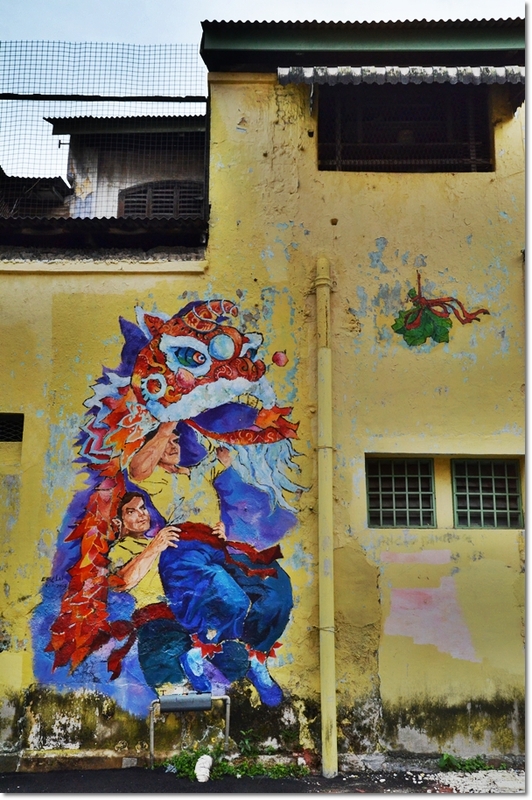 Just before you reach the traffic lights, look LEFT and you will see the back alley with the first painting; the Lion Dance.